Or distracted, idk. Anyways, just some drawings I've pumped out lately, since it's been a while since I actually finished anything. That being the case, I drew some fanart to get my out of my rut! I have a lot more sketches, but I haven't really finished anything. To the left I drew Sayaka, a character from Madoka Magica, a really great show that took me a really long time to get into, but I did, and I am really glad I did. 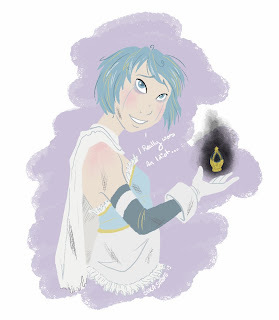 Sayaka is a great character, and I love her very much. This is one I drew for one of my best friends, who is a very big fan of the character Jinx from League of Legends. I got the chance to play her while she was one of the free champions, and I have to say, she was really rad. Tryndamere is still my favourite. I tried to draw Tryndamere. I forget how to draw beefy men. Nice to see something from you again.